Attorney John I. Peters has been serving Central Ohio by providing support to the residents of Licking, Knox, Perry, Fairfield, and Franklin Counties. His office is centrally located in Pataskala Ohio, but he believes in offering support to surrounding communities as well. When you have a problem that you need help with, you want to work with an experienced, down to earth, and knowledgeable Attorney. 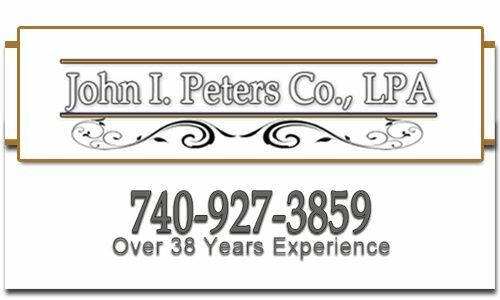 John I. Peters is there to support you with any of your Bankruptcy, Family Law, Estate Planning, Probate, Criminal and Traffic Law needs. Attorney Peters also has extensive experience supporting his clients with Estate Planning, Wills, and any Probate needs. When you are contemplating your future and how to protect your assets and family from the stress of losing a loved one, just call attorney Peters to schedule an appointment to make some smart choices for your family’s future. He strives to help families in distress with any support they need with terminating a marriage, parental rights, custody support, and civil protection orders. His years of practice has taught him that having trusted legal representation can ease the stress of these tough situations and help get your life back on track as timely as possible. It brings great joy to Attorney Peters to assist families with their consideration for adoption. Please consider giving him a call to help support your decision to extend your family. If you are looking to work with a professional who is knowledgeable, genuine, and personable to assist you with your legal representation give Country Lawyer John I. Peters a call. We are a team of legal attorney's handling injury cases, including car accident, workers compensation, divorce, estate & child custody in Troy, Tipp City. Resist that pressure, and call one of our attorneys immediately to speak on your behalf.